CHARLOTTE, N.C., APRIL 4, 2012 – Charlotte-based Belk, Inc., the nation’s largest privately owned mainline department store company, is seeking Southern designers of apparel, shoes and women’s accessories to add to its numerous collection of brands for its Southern Designer Showcase. Winning designs will be featured in Belk’s 125th anniversary advertising campaign and sold at Belk and on Belk.com in spring 2013. 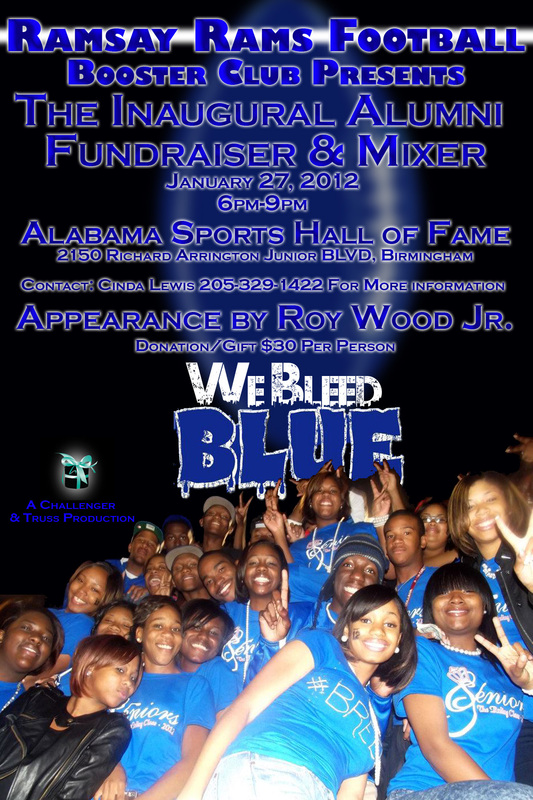 The Ramsay Football Booster Club is hosting its Inaugural Alumni Fundraiser & Mixer at the Alabama Sports Hall of Fame. Many alumni will be in attendance for a night which will feature nationally acclaimed comedian and alumni, Roy Wood Jr.
On January 27, 2012, The Ramsay Football Booster Club is hosting its Inaugural Alumni Fundraiser & Mixer at the Alabama Sports Hall of Fame. The event will take place from 6pm to 9pm. There is a $30 / person gift donation for this event and tickets can be purchased prior to the event. Many Ramsay High School alumni will be in attendance for a night which will feature nationally acclaimed comedian and alumni, Roy Wood Jr. Ramsay High School is celebrating its first year of football since 1976. The football team will embark on its first season as a 5A Varsity Team in 2012. They have been working hard to ensure an impressive showing! The goal for this event is to raise funds for football uniforms, travel, and weight room equipment. We look forward to a rich athletic history and storied success for this program. Come out and support this wonderful event and support the Ramsay Rams. All proceeds from the event will benefit the Ramsay Rams Football Team. This event will be catered by Creative Catering by Ambrosia. On October 15, 2011 Real Life Poets, Inc. will present its 1st Annual “A Night Of Unity” Fundraiser celebrating cultural diversity through the arts, hosted by WBRC Fox6 News Reporter Melanie Posey. This family friendly event will take place on Saturday, October 15, 2011 from 7:00pm until 10:00pm at the Grodner Group, located at 2255 Highland Ave S, Birmingham, Alabama 35205. An array of artistry will be highlighted including, spoken word, live painting, culinary, music, and media as an ethnic mosaic of artists, both youth and adult, take the stage. Featurerd Artist will be the Legendary Sunni Patterson. Also plan to enjoy a culturally diverse food tasting, henna body art and a silent auction. The fundraiser will follow a free poetry workshop at the 3rd Annual Collard Green Cook-off presented by Urban Minisrty’s West End Community Garden, 1229 Cotton Ave Birmingham, Alabama 35211. The Cook-Off is a free community event open to the public from 12:00noon until 5:00pm. Silent auction will begin online at www.32auctions.com/organizations/2137/auctions/2331 and end live at the event. Tickets for the event are $15 and can be purchased at www.anightofunity.eventbrite.com. For more information, to sponsor the event, make a monetary donation or donate auction items please call 205.585.8271 or visit www.reallifepoets.org. The event is being co-sponsored by the Grodner Group, Outfront Tutoring, and the Emerging Change Makers Network.